It's no surprise if you've been reading my blog or following me on Instagram for a while that I have turned into much more of a skin person than makeup person. Maybe it comes from working in the industry and seeing how different makeup can look on healthy, cared for skin versus someone that sleeps in their makeup regularly, never exfoliates, and doesn't think moisturizer is essential (it is, people). Or maybe it's because I'm not 19 anymore and I've started to see changes in my skin (wrinkles, texture, dark spots) as I've gotten older. Regardless, these are motivators for me to focus on skincare first and rely less on makeup to achieve a healthy, glowing complexion. First up, the Cleansing Oil. Again, if you've been here before you probably know my obsession with oil cleansers. They are a normal/dry skin's dream! Removes all traces of makeup without stripping the skin. Apply to dry skin, massage all over face and neck, even the eyes, simply rinse away with water and voila! I've tried a lot of oil cleansers out there, I'm pretty picky and this one is at the top of my list! Shown: mascara, liquid eye liner, 2 water-proof eye liners, & a liquid lipstick. After massaging the Cleansing Oil onto dry skin. After rinsing away the cleanser. NO residue! Another product swear by is the Sensitive Exfoliating Toner. This has glycolic acid in it as well but much less and is safe for sensitive skin types. I use this on days I don't use the Daily Active Cleanser. 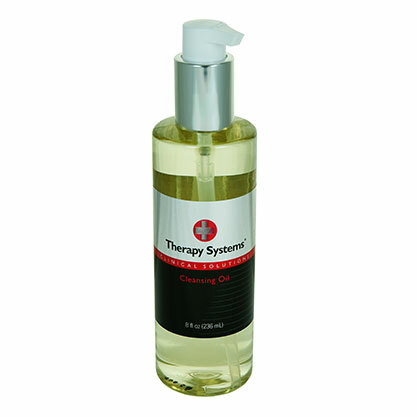 Just spray it onto a cotton round and sweep over a clean face to remove any dead skin or other impurities. I truly love this one so much, staple product for sure! Lastly, I finish my routine with the Vitamin C Cream moisturizer morning and night. It's lightweight + soothing and packed full of antioxidants. When I think of Vitamin C I think lighten, brighten, and tighten-- who doesn't want that?! I love this for lightening up some subtle but annoying acne scars on my temples. To be honest, I've already seen a change and I couldn't be more thrilled. 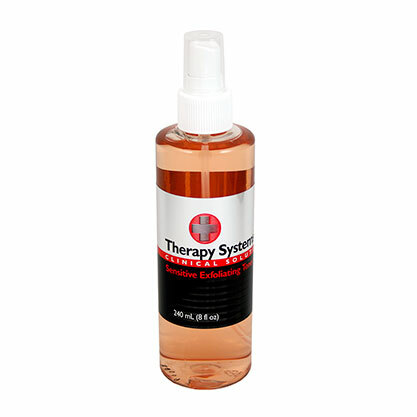 Therapy Systems is running an amazing promotion right now. If you leave a review on their website for a specific product, you will receive a special PROMO CODE to use at checkout for 25% OFF your purchase! Even if you haven't used the product, write a review stating you heard about the products from me and are excited to try them, then you'll receive an email with the code to use on the website at checkout. There are so many products I love and use within the Therapy Systems line depending on my current skin issues and the time of year it is. But I can tell you this, if you want to see actual changes in your skin and reverse + prevent signs of aging, you need to use some type of active product. Get yourself a routine that fits your skin needs and stick. to. it. You will thank yourself later.